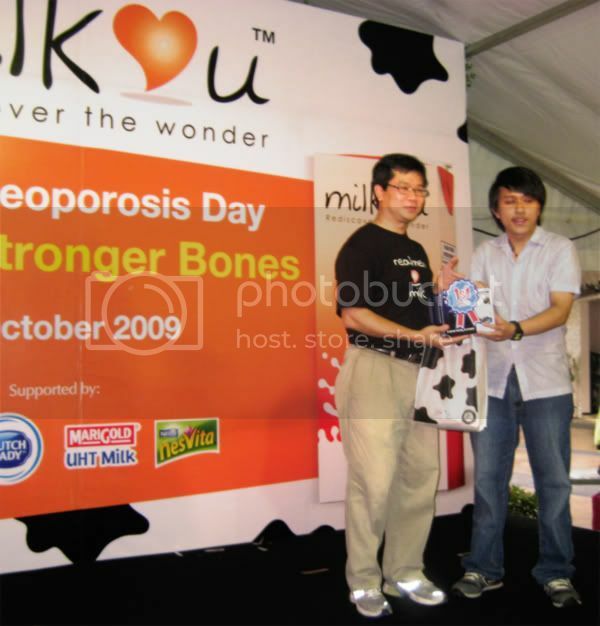 This event was held in conjunction with its campaign entitled "Milk Loves You" by Tetra Pak(Malaysia) Sdn Bhd. 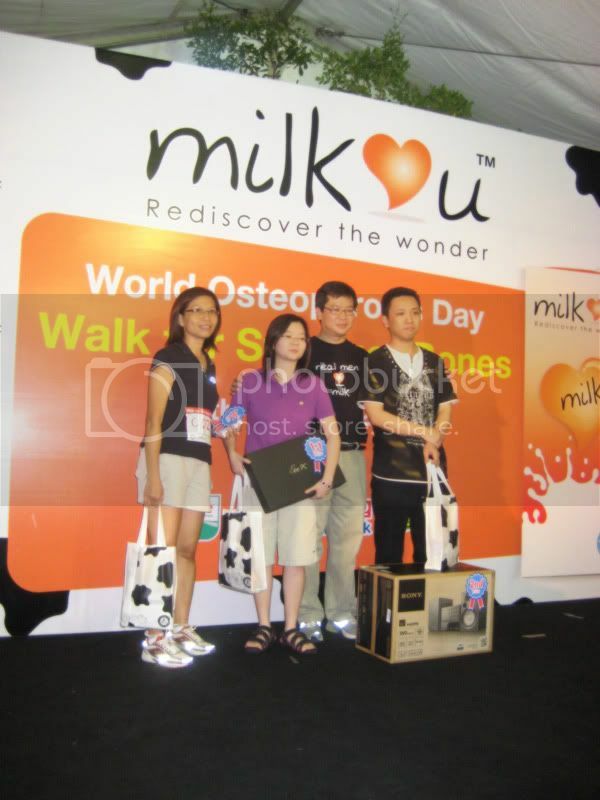 I was there for the prize giving ceremony and to perform my rendition of my song submission to its contest. The place was really nice. You can do shopping and walk near the lake side. It was like Malaysian's own Beverly Hills. Most teen girls there dressed up REALLY well. They walk their cute dogs also. You can visit their location website http://www.desaparkcity.com/ to find out more. 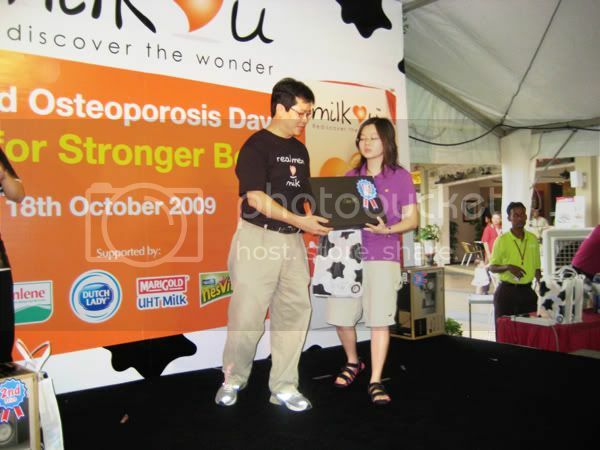 So, getting back to this World Osteoporosis Day in Malaysia. The event began with a walk. Then, some games with the crowds and audiences. 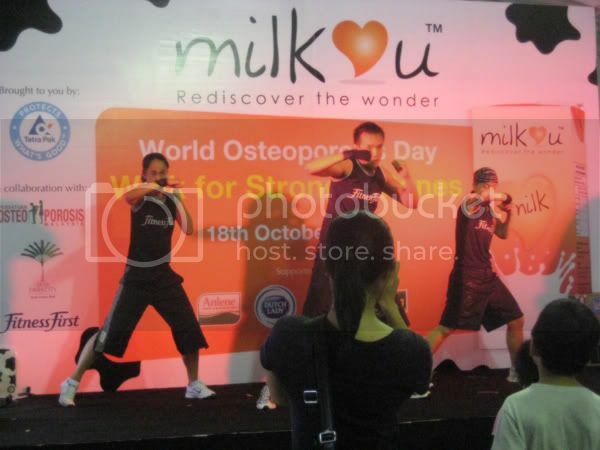 After that, it was the Body Pump Demo by Fitness First members. 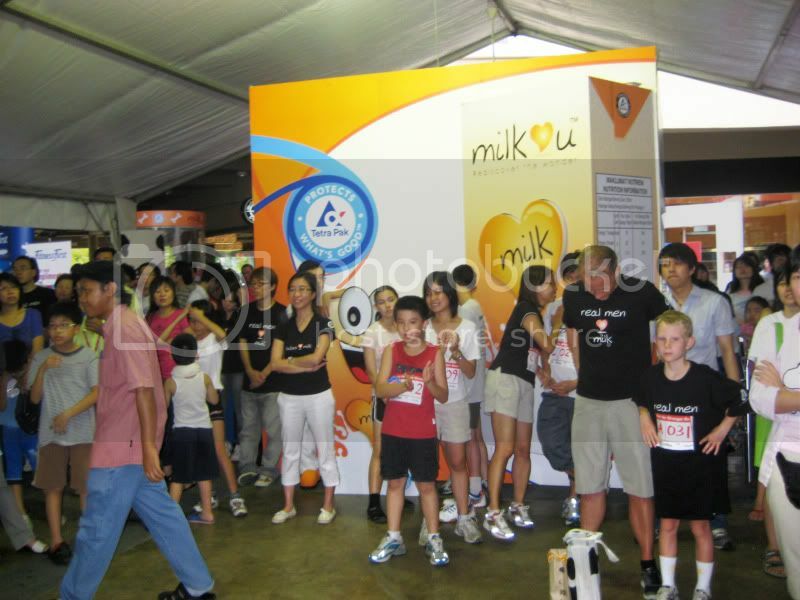 Alongside, there were booths of different dairy milk products for promotional sales and samples. 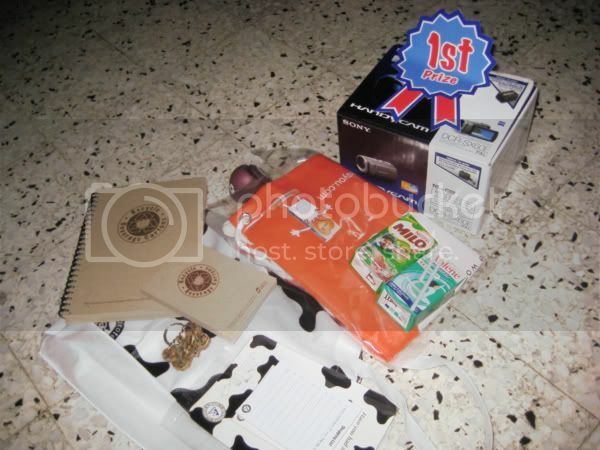 Then, it was prize giving ceremony for the winners. 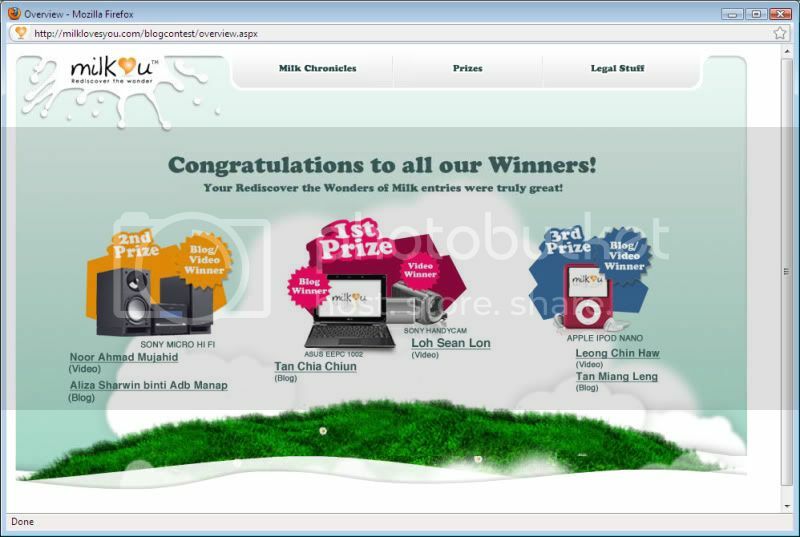 First category is the 'Blog winners'. 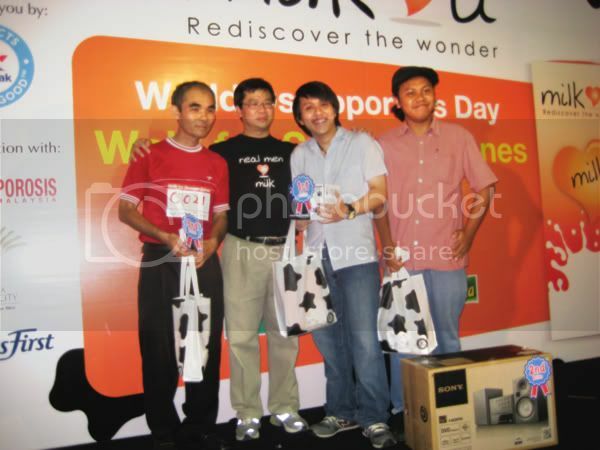 Next, it was prize giving for the Video category. Can you spot me in the crowd? Waiting before they call me for the 1st prize. LOL. That time, i heard one girl telling her parents behind my back, "Yeah. It's him. I recognize him, he's the guy." I panicked because I "Pai Seh"/ shy with my videos. I think she's the girl in white T shirt behind the red-shirt kid.lol. After I received my prize, I performed this song. hahaha. It had relevance for the theme. I felt very honored when they asked me to perform on the phone. Also, they put my performance as closing act and kinda like main performance, i think? Haaha. After most of the activities, the crowd/audience amounts increased . Thus, I get many staring audiences. 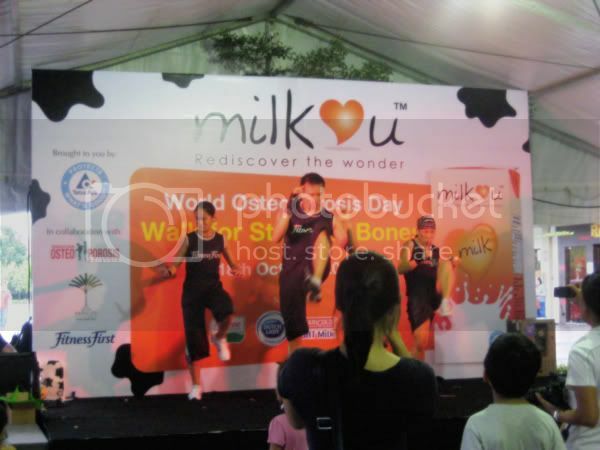 The aunties were really nice enough, they clapped along to my song. The host was really good also. I would like to commend him for running a mini sound test for me and the powerful introduction.lol. It's like a come back from hiatus in doing live gigs after many many horrifying experiences last few years such as technical encounters with the sound setup issues and personal nervous breakdown & etc. One thing I learned from this show is being comfortable with who you are. Gaining people support will help too. Nothing against the article, but I disagree with a couple of points to some extenct. I'm probably a minority though, lol. Thanks for sharing it on sean.at.ua . Велике спасибі за розробку зусиль , щоб обговорити це , я відчуваю себе сильно про це і , як вивчення набагато більше на цю тему . Якщо можливо , як ви отримуєте досвід , не могли б ви оновленням sean.at.ua мають великий набагато більше інформації ? Це дуже корисно для мене . привіт ! Hey, I am new to this site. This website is fantastic, i've learned tons from here already!